Grilled Aubergine with Spicy Chickpeas and Walnut Sauce….Sunday lunches are usually something new in my home. Experimenting with different flavours and textures, unexplored cuisines and also something which has not found its way to the blog yet, is the criteria. This Middle Eastern inspired plate is a good mix of delicious flavours and textures and is quite healthy as well. My husband who is not a big fan of aubergine asked for a second helping and that explains it all. Aubergine is a rich source of vitamins, minerals, and dietary fiber. Also, as it lowers the cholesterol, it is good to consume aubergine whenever possible. 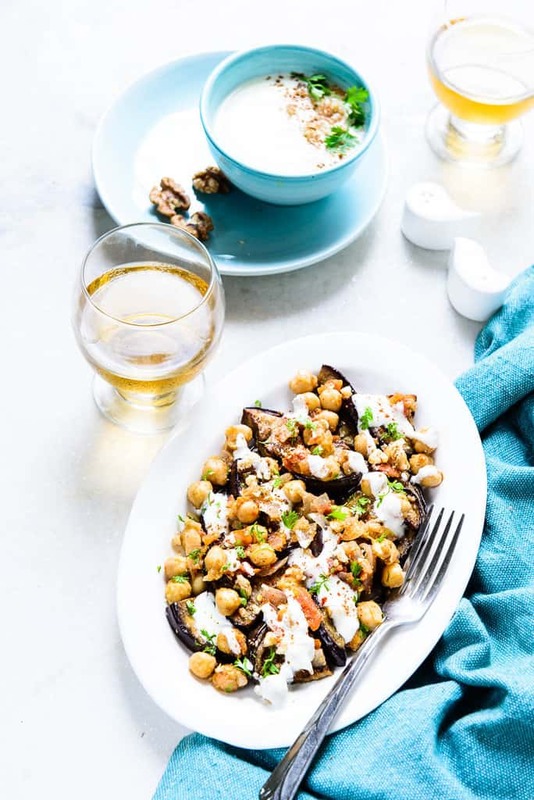 Grilled Aubergine with Spicy Chickpeas and Walnut Sauce is a soothing dish of Middle Eastern cuisine which is quite easy to make for brunches or dinners. The mix up of grilled aubergine with chickpeas and walnut sauce is something that generates a lot of interest. However, if you are desi at heart, you may even try Baingan ka Bharta which has a pleasantly smoky flavour. For now, here is how to make Grilled Aubergine with Spicy Chickpeas and Walnut Sauce. Heat olive oil in a grill pan. Arrange the aubergine slices in a single layer on the pan. Sprinkle salt and pepper and grill from both the sides till golden brown. Wash the chickpeas and soak in enough water for 6-8 hours. Drain the water and add the chickpeas in a pressure cooker along with 2 tsp salt and 2 cups of water. Add tomato and fry for a few minutes. Add ginger, red chili powder, cinnamon powder, nutmeg powder, cumin powder and coriander powder and fry for a few minutes. Add the cooked chickpeas and cook on low heat for 10-15 minutes. Increase the heat to high and cook till most of the water from the chickpeas is evaporated. Add all the ingredient in a blender and blend to make a smooth sauce. Arrange the grilled aubergine on a plate. Drizzle the walnut sauce on top. I too love exploring different cuisines. 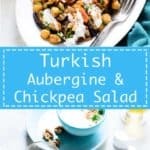 Although I’m not a big fan of aubergines, I think aubergines make a wonderful combination with chickpeas. And that walnut sauce looks delish! This dish tasted tasted wonderful Rose. You must give it a try.